Thinking of starting a loyalty program? An all digital program allows you connect directly to your customers and personalize the messaging based on their buying patterns and spending habits. Having an all digital loyalty program allows customers to turn their their mobile phone into a digital loyalty card. The high cost of having to produce cards (paper punch or plastic) cards as well as the possibility of fraud is deterrent for many to C Store Owners. With Tecmark's easy to use All Digital Program your customers will no longer have to fill out an paper or online enrollment forms or carry around those cumbersome paper or plastic loyalty cards. Using an all digital program allows you to use a customer's mobile to serve as their digital wallet and their phone number as their loyalty member number. You will drive more traffic to your C Store by sending personalized and targeted text messages such as birthday and welcome offers along with push notifications for instant savings directly to a members phone. Custom rewards is a great way to keep customers coming back to your store. According to VentureBear, the open rate of text promotions and offers is more than 90%! 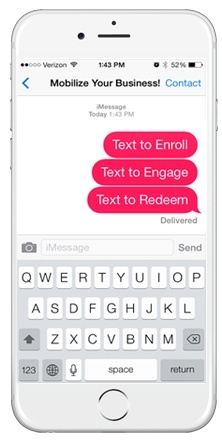 Texts are read within minutes, making it a great way to spark an immediate interest in sales and same-day promotions. Customers will not come back if a business doesn’t act like they want them back. They also will not make a second appearance unless they are given reasons. A successful business must offer a quality product but even a great product isn’t quite enough in this day and age. No matter how big a company or how loyal its consumers are, business owners and managers are constantly working to nurture those customer relationships in order to have continued growth. The nice thing is that having an all digital communication platform doesn’t have to cost a lot. Having a Facebook page and a Twitter account is another great way to create communications that involves conversation or feedback. Whether it’s on or offline, company-led or customer-led, engagement gives you the opportunity to learn more about your customers and promote and grow brand awareness. Listening to your customers allows you to make the necessary advancements in what you offer to keep them on board. According to Forbes, providing rewards around engagement encourages users to come back benefiting a business far beyond a tangible purchase while also benefiting the customers with a tangible reward. This tactic creates the much sought-after customer loyalty, providing a long-term financial benefit to the business by creating customers who keep coming back. Happy customers who are surprised and delighted by your offers will come back to your store generating more revenue and increasing profits making you a happy business owner. It’s a win-win for all! With our variety of industries served, flexible solutions and over 10 years of experience, we are happy to share our ideas for rewards program success. A well-planned and executed digital rewards program will create new customers, increase spend and grow revenue for your business. Tecmark is your loyalty program partner there to help you each step of the way.